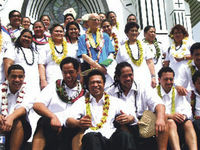 ATS ’09, a Samoan version of World Youth Day, attracted young Samoans from Australia, New Zealand and the United States for a week of singing, dancing, praying and festivities in September. The Wellington group arrived at Faleolo airport to be greeted with banners and flags hung from the ceiling as well as in front of the hall where the opening ’ava ceremony was held in Togafuafua. The group then went to a village called Falefa for a ‘days in the diocese’ experience. This was one of the most memorable parts of our ATS journey. The young people from Falefa Matagaluega (including neignbouring villages of Lufilufi, Faleapuna and Fagaloa) greeted us with leis, smiles and songs as well as a huge feast. A highlight of our time in Falefa was a bus trip to Lalomanu Beach where we played volleyball, rugby in the sea, performed items and had a huge barbecue. Afterwards we spent the night singing and dancing in Fagaloa with the young people there. The ‘Days in Apia’ started with a march through the town and an opening Mass in Mulinu’u. Among the different activities in Apia was a dramatic Stations of the Cross, a 4.00am Rosary Walk from Vaivase to Mulinu’u, praising with other youth groups in Leulumoega and Mulivai, and catechesis sessions. Here we were inspired by the speakers’ passion to live the ATS’09 theme. Images: Above: Poni and Elama of the Samoan chaplaincy and left, Samoans from Taita with their parish priest, Pat McCullough.